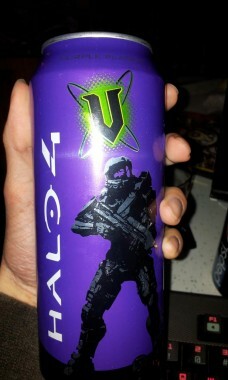 So the folks over at Frucor Beverages have recently released a tie-in Purple Plasma V Energy Drink with Halo 4 packaging. What’s cool about this is that it also includes an opportunity to win a limited edition Halo 4 Xbox 360 console and is plastered with Halo and Masterchief branding. However, this is a drink, and as such we must ask ourselves: is this a drink worth drinking? So the first thing you’ll notice about this drink is that it is a 500mL variant of the drinking canister. So if you’re somebody who is sensitive to large doses of caffeine, you may want to share this with a friend or pace yourself with it. Us here at Capsule Computers, and I’m certain the guys over at the V headquarters, definitely don’t want you overdosing on caffeine; regardless of how good the drink it’s in it tastes. Upon opening the drink, you’ll notice a fragrance that is somewhat unusual. It may offend some noses, but I quite enjoyed it. I would liken the smell to that of crushed grapes, or rotting grapes, something like that. It’s quite enjoyable. By now you’re probably wondering how the drink tastes. But how do you describe a taste? I’d go with some kind of bitterness scale here and after taking a swig of the drink (and another), I’d say that it isn’t exactly bitter. It’s not super-sweet though, Blue V is much sweeter. How else would one describe a taste? What could I liken it most to? As someone who loves grape themed drinks, this was my first go to answer, however… I’m not entirely sure I’m right here. I could also just be associating the colour purple with grape and therefore am more inclined to say it tastes grapey. So instead of liking it to something that exists, I’m going to liken it to a feeling and that feeling that I will be likening it to is the feeling of awesome. Drinking Purple Plasma V gives one a sense of awesomeness, which is very similar to the feeling of badassedness. 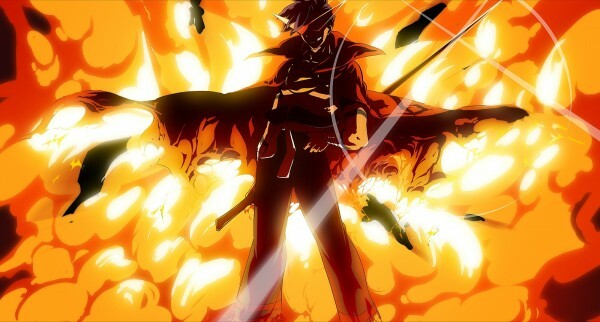 Kamina’s sweat, something everyone can look forward to tasting. Taste the badass. Taste it good. Overall the Purple Plasma V is a drink that I would heartily recommend to anyone that enjoys energy drinks. The can has a great look, the drink has a fragrant smell and the taste is what I imagine the great Kamina of Tengen Toppa Gurren Laganns sweat would taste like.